Imagine moving into a house without a heating system – what would you do? Contact the developer and demand they put one in immediately? Call a solicitor and sue the builder? Or sit back and enjoy living in a house, designed to meet your expectations of comfort without any recourse to a space heating system. 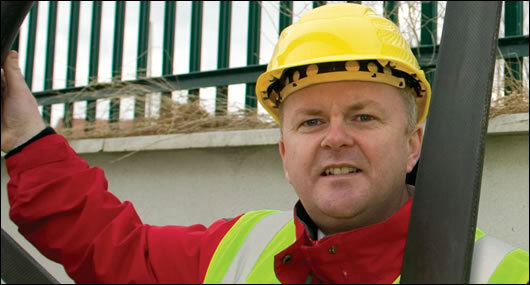 Jason Walsh met the people behind Ireland’s drive toward the passive house. Designed to ultra-low energy use standards, passive houses require little or no energy for space heating or cooling. 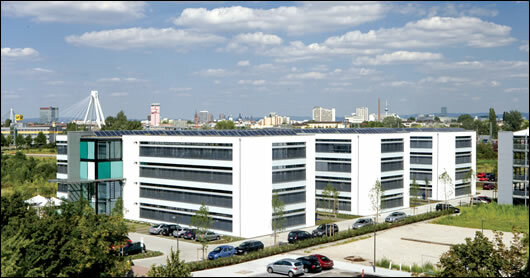 The first passive buildings were built in Darmstadt, Germany in 1990 and occupied in 1991. The concept of the voluntary standard was pioneered by Dr. Wolfgang Feist, who went on to found the Passivhaus Institut in 1996. The institute operates as an independent research institution employing building physicists, mathematicians and civil, mechanical and environmental engineers to perform research and development on efficient energy use. Currently Ireland has only one certified passive house, a fact which appears to contradict claims of a growing groundswell of interest. However, dozens of other homes have been designed and built as passive houses, with many more at the planning stage. Passivhaus Institut certified products are finding their way onto the market, with prominent examples including windows from companies such as Optiwin, Internorm and Niveau. Add to this the roughly 70 Irish delegates including developers, architects, sustainable product suppliers and local authority officials who attended the recent 2008 Passivhaus Institut conference in Nuremberg, and Irish interest in the passive house is confirmed. 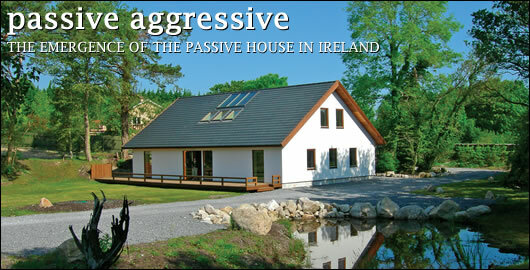 Ó Leary built Ireland’s first officially certified passive house – his own home – in 2005. Located in Ballykeppogue, County Wicklow, Ó Leary’s house has served as something of a prototype with Ó Leary’s architectural practice MosArt terming-up with consulting engineers Energy 365 to open a passive house ‘centre of excellence’ in Rathnew, County Wicklow late last year. Since then there has been a massive growth of interest in passive houses but regulatory developments are also having an effect. After an unprecedented 40% energy and carbon dioxide reduction kicks in to Part L of the Building Regulations in July, an additional 20% reduction has been signaled for 2010. This should bring our regulations within touching distance of the passive house standard, prompting some to ask why the country can’t go that little bit further and implement the passive standard as a basic requirement for all Irish housing. The usual objection to passive houses is that the standard is simply too difficult to meet. 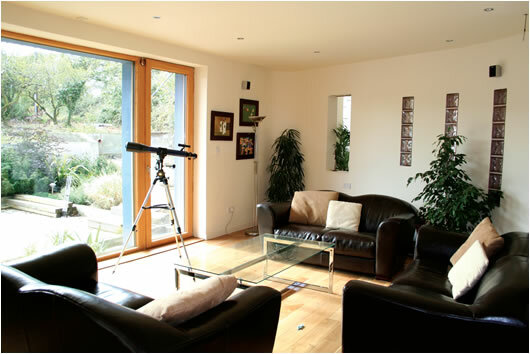 In fact, the basic requirements for a passive house are relatively simple: attention to detail in orientation and use of passive solar, good insulation, good glazing, heat recovery ventilation and, crucially, air-tightness. The document, Passive Homes: Guidelines for the Design and Construction of Passive House Dwellings in Ireland, has been lauded across the energy and construction sectors. Ó Leary’s key insight is that Ireland’s climate makes passive houses affordable and easily achievable. Sustainable Energy Ireland’s Paul Dykes told Construct Ireland that the recently published document has already been a success: “We’ve distributed over 500 hard copies and 3,500 CDs,” he said. “The point is to raise awareness of the concept and ensure that developers and architects have access to the guidelines and the right standards,” he said. Energy consumption rates have begun to decline exponentially in typical Irish houses over the last number of years. This has come mostly as a result of improved insulation, something which is vital in a passive house. However, a key difficulty facing potential builders – and buyers – of passive houses is air-tightness. Air-tightness is vital in a passive house as it facilitates the use of heat recovery ventilation (HRV) for space heating. Unfortunately, air-tightness is not something that Irish houses are renowned for, meaning that potential buyers and self-builders would be well advised to seek out experts in the field before committing to a project. SEI’s guidelines state that the air-leakage must not exceed 0.6 air changes per hour using 50 Pa over-pressurisation and under-pressurisation testing. “The reason that the passive house concept is gaining such a foothold in Germany and spreading out from there is because of the simple win, win, win strategy it entails,” said David McHugh or heat recovery ventilation specialists Pro Air. “The end user wins because he knows that not only will his heating bills stop rising each year but will disappear altogether after the initial investment. The low energy industry wins because their product now becomes recognised as a value for money investment. Everybody else wins because the elimination of heating and cooling systems in buildings could reduce our CO2 emissions by an impressive 40 per cent. “The strategy to be adopted in attaining a passive building is to insulate, seal and ventilate it efficiently,” he said. “Dr. Feist used the following three pronged strategy when he sat down in 1988 to design his dream home. As an engineer he knew the challenge lay in halting the migration of heat from inside to outside, stop the movement of cold air through the structure, to insulate and provide a healthy living comfortable indoor environment. To get these components right involved some calculations which we now take for granted. He had to calculate the amount of heat that a normal family, in an average house, would create by their activities, in watts at any one time and then annualise this into kilowatt hours. Having devised a figure for this he could work out the levels of insulation necessary to prevent this heat escaping. More and more companies are moving into the passive house field. Acting as both a show home and a real dwelling, Wolf Passive Homes has now built its first passive house, entering the Irish market. Dunne’s professional background is interesting insofar as it could be seen as a ringing endorsement of the passive house, once seen as a fringe idea, by the mainstream. He worked as a director of a German bank’s Irish operations at the IFSC for sixteen years. Dunne says that it was during his time at the bank that he began to become aware of sustainability: “I’d seen quite a lot of renewable energy products coming into Ireland over the years but I also came across some wonderful products, particularly in the building industry. “Furthermore, I wanted to give something back,” he said. In the interests of comfort and, above all, psychological security Dunne did install a space heating system in his house. It has never been used. “We have a pellet-burning stove but we [eventually] sealed-up the flu when we realised we would never need it,” he said. In the public mind passive houses and timber frame construction are strongly linked but Wolf Passive Homes’ dwellings are constructed from insulated concrete formwork (ICF). Dunne says that Wolf’s ICF has specific advantages that its competitors don’t: “The reason I chose it over other ICF was that this company has a polystyrene base that creates an air-tight envelope. Most other ICFs didn’t offer that, they were more like traditional builds and fifteen per cent of heat loss is through the ground. Indeed, both air-tightness and good insulation are central to the entire passive house concept, something that is as true of this two storey, 4,500 square feet (418 square metres) dwelling as it is of any other. The house’s north-facing orientation goes some way to proving that the need for passive solar gain doesn’t mean all buildings must be south-facing: “All of the large windows are to the rear which is southerly” explained Dunne. The house contains a heat recovery ventilation system which contributes approximately six kilowatts of heat - suitably small amount for such a negligible heat requirement. The 44 centimetre-thick walls achieve a U-value of 0.098 and the base has a U-value of 0.13. The roof uses a 28 centimetre-thick polystyrene block with a steel profile and achieves a u-value of 0.12. According to Dunne there is growing interest in passive houses, despite the fact that it’s early days for Wolf Passive Homes: “People are becoming more familiar with what a passive house is. The building energy rating (BER) and the recent initiatives by the Green party are helping but it will take time.” He also pointed to popular television programmes such as Channel Four’s Grand Designs and RTÉ’s About the House, presented by EASCA founder Duncan Stewart, as helping to raise awareness of the issues. 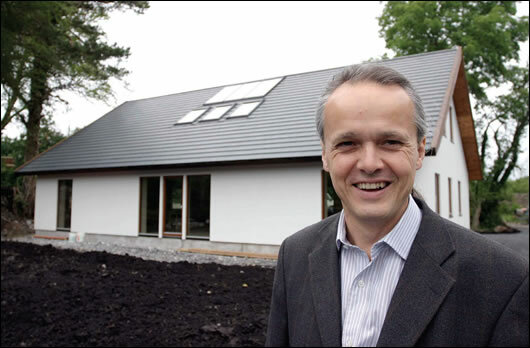 German architect Herman Richter has built a passive house in Swords, County Dublin. 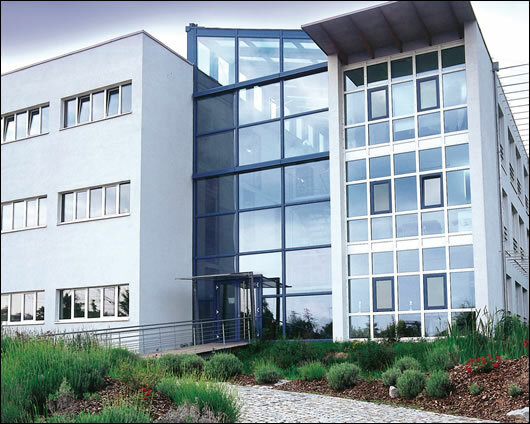 Richter’s firm, German Eco Homes, has offices in Dublin and Schweinfurt, Germany and is something of a one-stop shop for passive houses, offering architectural design, timber frame manufacturing, contracting and building. Richter told Construct Ireland how the project got started: “The customer located us on the ‘net – they specifically wanted a passive house,” he said. “We did the planning – we have an in-house planning department [so] we applied for planning permission and got it in a very short time. There was just one meeting with the planner and there were no objections. Also on the site is the occupant’s previous home, a traditional concrete-built bungalow dating back to the 1960s. It is now used solely for storage. Richter explains that German Eco Homes builds with natural materials: “We don’t use a plastic vapour barrier membrane. We don’t need it because it’s a breathable construction. On the outside we have a 350 millimetre wood-fibre board and a Tyvek breathable membrane, a ventilated cavity and plastered cement board. The additional heating in Richter’s houses is provided by heat recovery ventilation. In addition, the old house’s oil boiler was not decommissioned, though it has not been used as yet. Finally, solar panels provide domestic hot water. Not all of Richter’s designs are strict passive houses: “We also build low-energy houses. In Germany it’s harder to build a passive house due to the colder climate. A German low-energy house virtually meets the passive house requirements in Ireland. It needs a little more insulation and triple-glazed windows. “I think the passive house is very easy to build in Ireland – the advantage of the higher winter temperature is vital,” said Richter. “Our [energy consumption] target is 15 kilowatt hours per metre square, per year. Aside from Ó Leary, Ireland’s pioneer in passive houses is Scandinavian Homes. The County Galway-based firm has been building near passive homes since the early 1990s, before increasing the spec to passive house levels in 2005. The firm’s founder Lars Pettersson, regarded as something of an expert in the field, is concerned that passive houses are suffering in Ireland as a result of the building energy rating (BER) scheme. Pettersson stresses that his own houses, for example, achieve high B-ratings rather than the expected A-ratings as a result of use of electrical energy to heat bathroom floors for comfort. “It’s very serious. It means that people building passive houses could get a poor rating. It discriminates against better housing,” he said. Relatedly, Pettersson argues that the increasing complexity of some passive house designs is a problem: “Since they were introduced in the 1990s they’ve become more complicated. In Germany they are becoming a luxurious thing for the few. That’s the way things are going over here too. They overcompensate with pellet burners, heat pumps and all sorts of complicated systems. For Pettersson the negative focus on electrical energy is wrongheaded: “I’m quite annoyed with all of this ‘zero carbon house’ business. My position is that you should be able to have a house without heating but that won’t sort out your refrigeration and lighting, for example. This is the nub of Pettersson’s argument: passive houses are so efficient that a small amount of electrical energy used to heat bathroom floors and top-up hot water in the winter should be a non-issue but under the current BER regime, homeowners will be penalised for doing so. “We use 810 watts to heat 250 square metres. That’s 3.24 watts per square metre – that’s all we need in Ireland’s mild climate. In arguing for recognition of designed sustainability before retrofitted mechanical systems Pettersson sums up the key benefit of passive houses succinctly: “By investing in the money you would otherwise spend on a complex heating system such as wood pellet or geothermal in insulation and air-tightness you don’t need complex systems.” Early signs however are that many of the Irish people looking to build passive houses are erring on the side of caution, and including small space heating systems, just in case they’re needed.